In the wild most remaining Niedzwetzky’s apple (Malus niedzwetzkyana) and Bukharan pear (Pyrus korshinskyi) trees are often found growing alone, and are showing limited signs of regeneration. To enlarge and fence wild populations of Niedzwetzky’s apple and Bukharan pear in three sites and equip local people with the skills and resources to ensure their on-going protection. 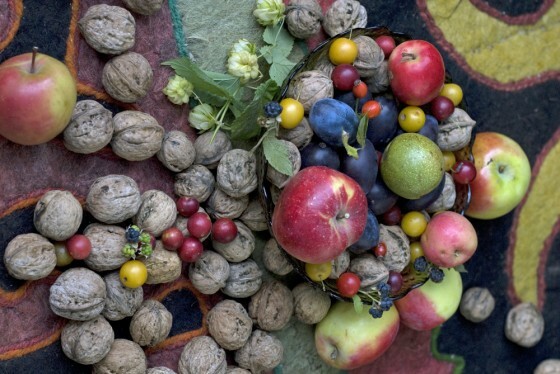 The ancient fruit and nut forests on Central Asia have often been described as the original Garden of Eden; bursting with flowers and edible fruits. These forests contain the wild, living relatives of many domesticated fruit and nut varieties (including apples, almonds and pears) but many of these wild relatives are rare and highly threatened including Niedzwetzky’s apple and Bukharan pear. The rarity of these species is partly due to the fact that there is little habitat left; in 2011, Conservation International reported that the fruit and nut forests had declined by 90% from 1960 – 2010. Kyrgyzstan however, is thought to contain the largest extent of the remaining habitat in Central Asia. Products of the fruit and nut forest. Credit: Jason B Smith. Still, Kyrgyzstan’s forests are used by local people for many purposes, including the harvesting of food, fuel, construction materials and fodder for animals. Livestock grazing is a particular problem; the widespread and unmanaged grazing of sheep, cows and horses within the forest, threatens the survival of rare fruit trees because saplings in particular are attractive to herbivores, so saplings have almost no chance of surviving a year. 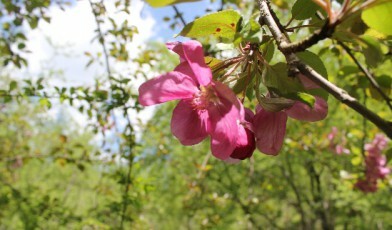 This problem with grazing is exacerbated by the extreme rarity of the threatened apple and pear trees in the forest. 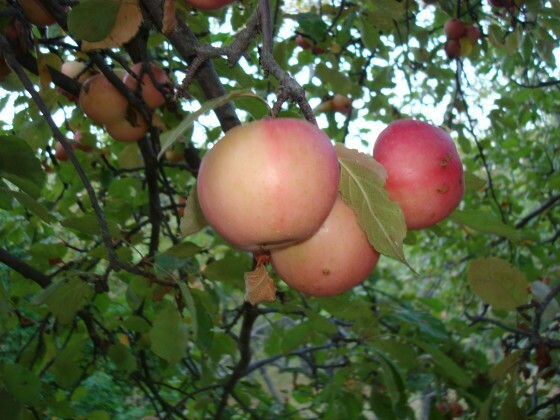 For example, Niedzwetzky’s apple trees are often found growing alone, and many kilometres away from any other individuals which limits the chances of cross-pollination with their own species. This means there are fewer saplings in the forest, even before the risk of grazing is taken into account. Without specific, targeted actions to protect these very rare trees and their offspring, it’s likely that they will slowly disappear from these ancient forests. Niedzwetsky’s apple fruit. Credit; GTC. Increasing the number of individuals by planting new trees within proximity of existing populations of Niedzwetzky’s apple and Bukharan pear. Protecting mature trees from illegal felling, and young saplings grazing by livestock through awareness events and construction of fencing. Working with local villagers to encourage planting and protection in fenced areas in the forest. Training of forestry staff has been a core theme of the work in Kyrgyzstan; since 2011 we have trained forestry staff in core tree conservation skills including species identification, monitoring techniques and seed collection. In addition, we’ve established three nurseries in order to produce threatened fruit tree seedlings for reinforcement in the wild. This has led to the propagation and subsequent planting of more than 2,000 Critically Endangered Niedzwetzky’s apple trees since 2011. We continue to grow more saplings in four field nurseries and more recently, we have collected seeds of Bukharan pear, which are also currently growing in nurseries, with a view to plant them in the forest over the next several years. Over time, FFI has developed strong links with communities surrounding key sites of the fruit and nut forest. We have built these relationships steadily over the years through awareness activities with schools, harvest festivals and supplying essential equipment. Co-funding from the Darwin Initiative and the Christenson Fund has strengthened this work; providing livelihood opportunities and reinforcement of traditional cultural values related to the forest. This has contributed to eight community members actively engaging in the conservation of Niedzwetzky’s apple and Bukharan pear, through voluntarily planting seeds and raising saplings for reinforcement efforts.